‘A Girl & Three Sweethearts’ takes on Taiwan! Bringing you more heart jerking moments with this spin-off special! 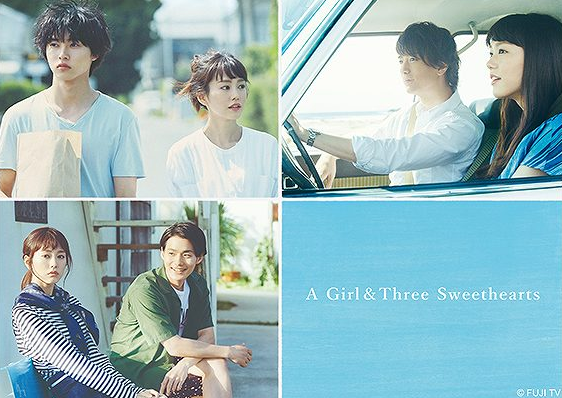 ‘A Girl & Three Sweethearts’ is currently be broadcast all over Asia, no only in Japan. From the sixth episode, actress Reina Ikehata (active in both Japan and Taiwan) plays the role of a capable restaurant producer Naomi Ohashi. This is her first time to appear in a Japanese television drama series, and we are all happy to see her have this direct route to appearing on screens throughout Asia. The production of this spin-off special of ‘A Girl & Three Sweethearts’ has been confirmed to take place in Taiwan! Starring Toma, played by Shuhei Nomura! This spin-off stars the youngest of the three guys from ‘A Girl & Three Sweethearts’, Toma Shibasaki, played by Shuhei Nomura. He continues to play the same role in this spin-off. Did you know that he is also fluent in Chinese? He is quarter Chinese, and also attended a Chinese Elementary and Junior High School in Japan, and that’s why he is good at speaking Chinese. Also, the first country that he visited for work was Taiwan, so it’s a special place for him. This year when he was there on work, he showed off his fluent Chinese and BMX skills! Perhaps the penny has dropped for those among you who are fans of ‘A Girl & Three Sweethearts’? That’s right, Toma’s talent is also BMX! Namer revealed in an interview that, “Since Toma is into street style, he has a side to him that is actually very much like me”. This makes him an absolute perfect fit for the role. Star-studded cast will make you want to fall in love too! A previously released outline for this production states that this show clarifies the shocking development that occurred when Toma declared his love for Fey, a restaurant waitress that he met by the sea. Fey is played by the incredibly beautiful and highly talented actress, Wang Yi Wen. Tetsu, a good friend of Fey’s from work is played by Teddy, a member of the hugely popular idol group ‘SpeXial’. Fey’s close friend Lulu is played by Ting, from Taiwanese idol group A’N’D. And Fey’s crush Tony, a young go-getter is played by Chiu Hao Chi. With a cast full of Taiwan stars and hugely popular Japanese actor, my heart is already beating harder! The production is being overseen by Fuji Television and romantic drama hit maker Comic Production. Having already successfully created Taiwan versions of ‘Hana Yori Dango’ and ‘Itazura na Kiss’, there is no doubting their ability to set knees wobbling with this new production! show ‘A Girl & Three Sweethearts’ can continue to watch it as you wait, but we also recommend watching A Girl & Three Sweethearts’ for those of you who want to see the actors that star in the show, or those of you who want to watch a good love story, or even for those of you who simply aren’t getting enough mushy-romance recently!